A complete line of powder plenders to cater for yoru exact requirments.The best way to resolve your pwder addition application is to allow us to design the best technical and cost effectve solution for you. The stationary Alfa Laval Hybrid Powder Mixer S15 is a patented hygienic unit that both disperses powders into liquids quickly and efficiently and pumps the resulting solution at outlet pressure of up to 5 bar, all using a single motor. This versatile, easy-to-use mixer produces homogeneous products at high dry matter concentrations and high productivity. A mini system incorporating the Ampco Shear pump with a small volume hopper. Designed for easy opperation whilst still providing a harmogenous mix. 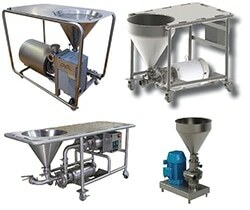 Mobile powder mixing assembly. Designed for powder addition into a liquid stream. The first pump providing teh necessary suction to draw the powder into the liquid strea,m. The second pump providing the homogenous mix and pumping pressure back to production. Fixed powder addition assembly. Designed for powder addition into a liquid stream. Mixing is obtained through agitation in the vessel or through continuouse recirculation until satisfied.